Jack Marriott celebrates his goal for Posh against Portsmouth with team-mate Marcus Maddison. Photo: Joe Dent/theposh.com. 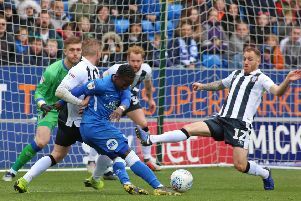 Peterborough United top scorer Jack Marriott is praying for a perfectly-timed delivery at the weekend...and he’s not talking about a Marcus Maddison cross. Marriott, who claimed his 13th goal of an exceptional first season at the club against Portsmouth on Tuesday, is due to become a father for the first time on Sunday (November 26), one day after he’s due to be in Rochdale for a League One match and two days before Posh are playing away at Charlton in a big promotion battle. Jack Marriott scores for Posh against Portsmouth. Photo: Joe Dent/theposh.com. A Sunday arrival for junior would therefore be ideal, although Marriott will have a fast car at Spotland ready to dash him to hospital if necessary. Wigan’s Ryan Colclough scored twice on Tuesday before racing to hospital after his partner went into labour. “We’re buzzing about the baby,” Marriott enthused. “It’s our first one and we’re very excited. We can’t wait to be honest, but of course I will be at Rochdale. I will concentrate on the game and my car will be at the ground if I need to dash off. I just hope the baby comes on Sunday as expected. “Rochdale is a big game for us because we need to build on a very good second half performance against Portsmouth. “We played with energy and tempo and when we do that we are hard to stop. “I was pleased to score in that game and I’m lucky to have someone like Marcus Maddison supplying me. “When he drifts into wide positions I know he is going to cross the ball early so it’s a case of getting in the right position. “Marcus has something like 11 assists this season and it probably should be more. We could have scored many more goals from his set pieces. “I’m pleasantly surprised to have 13 goals already this season, but I deliberately set my targets high so if I do fall just short I still have a reasonable number. League One top scorers (league games only): 13 Kieffer Moore (Rotherham), 12 Brett Pitman (Portsmouth), 11 Eoin Doyle (Oldham), Marriott (POSH), 8 Charlie Wyke (Bradford City), KyleVassell (Blackpool), Devante Cole (Fleetwood), Jermaine Beckford (Bury).